Duwest Village is one of Toronto’s best kept secrets. It is situated on Dundas Street – west of the CNR/CP tracks intersecting at Dufferin, Brock and west of Gladstone. It is one of Toronto’s older neighborhoods with housed working class families who helped build Toronto. Dundas Street West in the Toronto Village of Brockton is becoming an increasingly popular neighbourhood. It can be described as how Queen Street West was (10-years ago). It still maintains the look of Old Toronto with most of its architecture still in place. Unlike other established Toronto districts, it has little or no infiltration of StarBucks or Tim Horton’s franchises. The area still maintains its Portuguese roots and has many family run businesses. 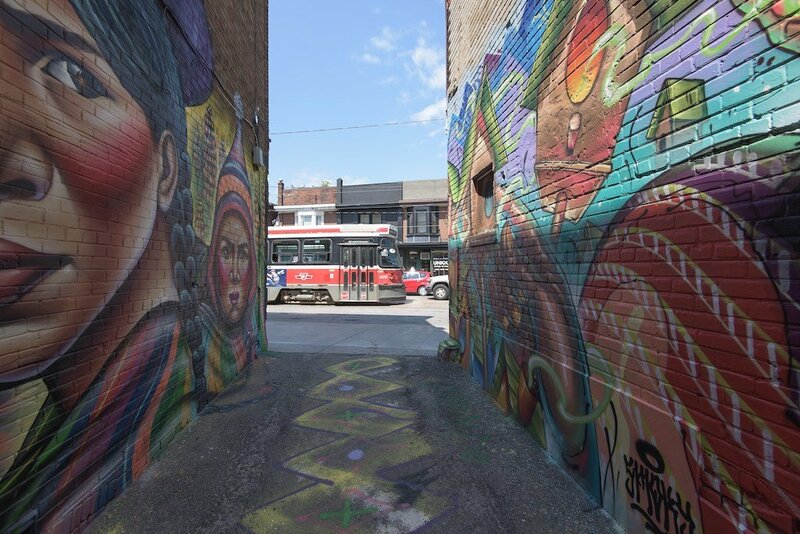 Artists are predominant and tasteful Street Art is now rivalling the Queen and Bathurst area. 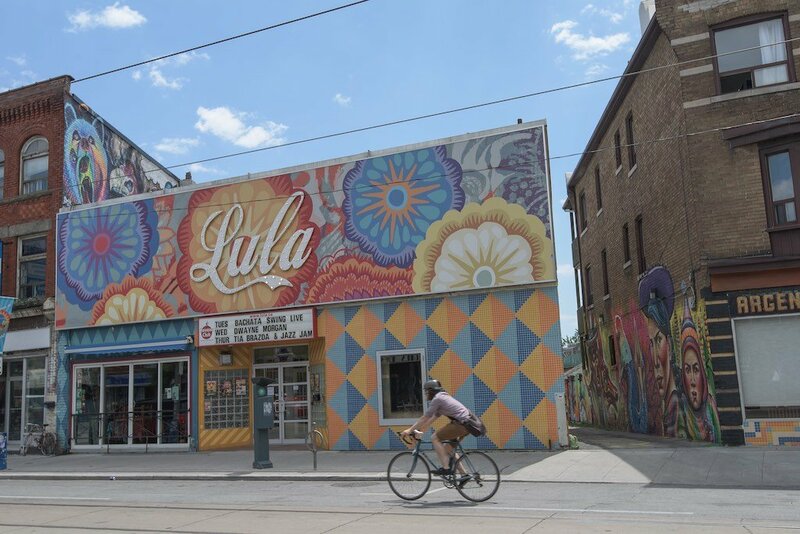 A newly painted alley is just next to the Lula Lounge on the south side of Dundas near Sheridan. Here is an example of work by 3 of my favourite street artists Bruno Smoky, Shalak Attack and Gilda Monreal (aka Fiya Bruxa). 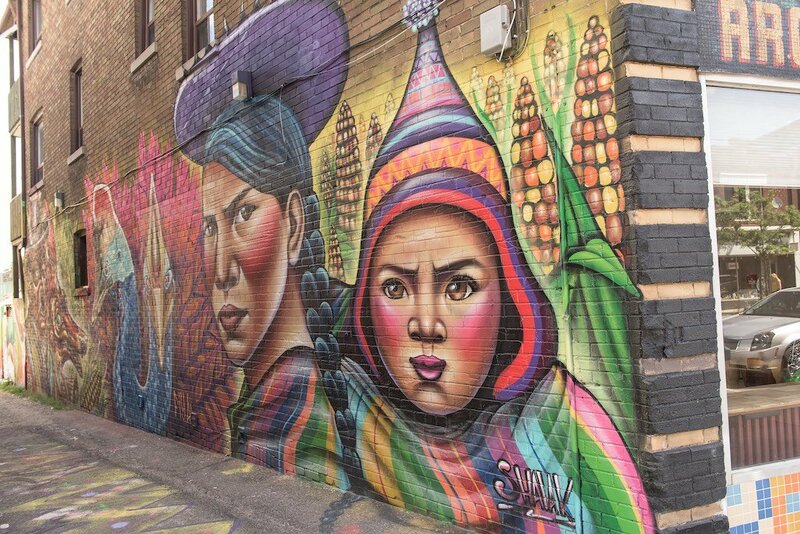 They are amazing artists and are beautifying Toronto and other cities around the world. Here’s an example of their work near the Lula Lounge on Dundas West near Sheridan. If you get hungry, there is no shortage of eateries and bakeries run by families who make home cooked meals. One of my favourite bakeries is Padaria Brasil. It’s a family run bakery and is situated at 1566 Dundas Street West. They have a wide variety of freshly baked pastries and breads – both sweet and savoury. I recently had the cod sandwich on a freshly baked bun for just around $5! The custard tarts are also fantastic. If you want something more formal, yet casual. try The Federal situated at 1438 Dundas St W, Toronto, ON M6J 1Y6. 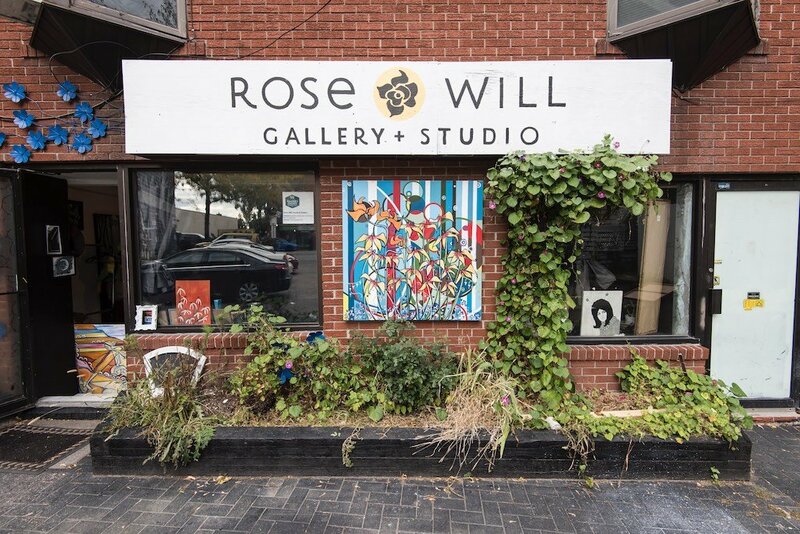 Another place to check out is Rose Will Studio located at 1630 Dundas Street West. It opened up just 3 years ago and is run by a fantastic artist (and person) Tenille. She specializes in colourful oil paintings and some of her work has appeared on labels of Hillebrand Wines. The studio is run as a co-op and has regular events and classes. Fine art is also available for sale at great prices. I have recently joined the co-op and will be showcasing my photography there as well. Make sure you check out DuWest. It has something for everybody! 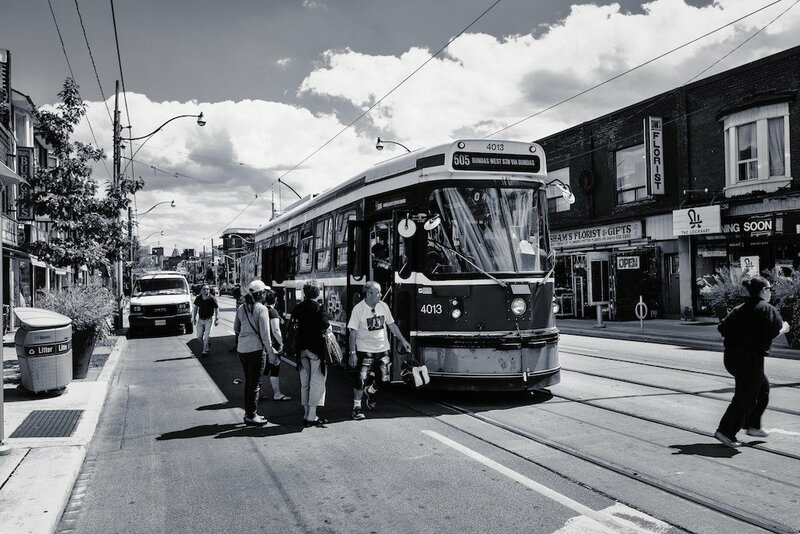 This entry was posted in DuWest, Toronto, Uncategorized and tagged DuWest.